#1 Several posts ago, back in November, I mentioned that we were going to have a tree with ornaments that could be bought with a donation to the Hanover Area Red Cross. This was the second year that we decorated the tree with an assortment of ornaments offered for a $1.00 donation (several of you gave more). You came through — again! The tree was almost emptied of its ornaments and you donated a total of $294.00 !!! We matched that donation to deliver a total of $600.00 to the Red Cross. It looks like we may be making this an annual event! #2 Back in December, the great people at DEMDACO (Willow Tree®) had sent us several of Susan Lordi’s creation The Christmas Story to give away. Everyone who stopped by thru the holiday season had the opportunity to register for the give-away. The week before Christmas, we picked 4 names out of all of you who signed up, and the 4 winners were excited to receive such a special prize. sculpture of the Holy Family, you will now have an additional choice. A smaller version of the same piece will be available later this year. You can be sure we will have it on display as soon as it arrives! Here is a photo of the original one we have in the store along with the Gentle Stable Animals. The Sanctuary, Susan Lordi’s interpretation of the creche, is not pictured. 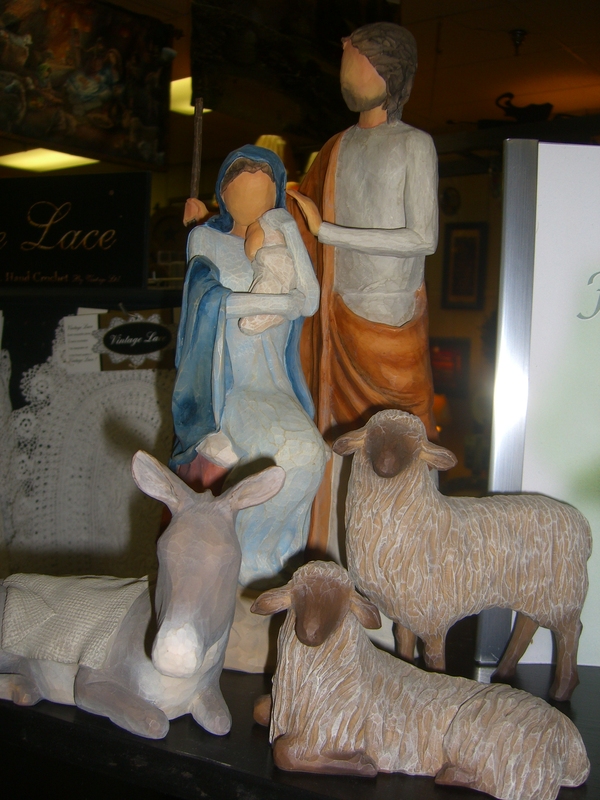 We always try to have extra pieces of Willow Tree® Nativity and The Christmas Story in stock for your purchase. When you are looking for a special gift throughout the year, pieces from these collections are a great choice! #3 We’ve gotten our Save the Date postcard — for 2011 Daffodil Days! This will be our 6th year participating in this event which features the Bear and a Bunch with a special American Cancer Society Boyds® Bear (Liv N. Hope) and a bunch of daffodils. Starting now, we are taking names to reserve your Bear and a Bunch for delivery in March during Daffodil Days. We also have information on Project Care and Gift of Hope to cheer someone in cancer treatment and we will have extra bunches of daffodils available in March for you. Reserve your Bears and Daffodils before Valentine’s Day to be sure we will have one available for you. If you have questions about this fundraiser, please give us a call. Or contact the York Area Cancer Society.